2. Press cookie mixture evenly into the bottom and up the sides of a greased 23 cm tart pan, with removable bottom, then set aside. 3. Put peanut butter chips into a microwave safe bowl. 4. Add 1/2 cup of heavy whipping cream to bowl. Heavy cream should mostly cover the peanut butter chips. 5. Microwave mixture until cream begins to boil, about 1-2 minutes. 6. Remove from microwave and whisk until smooth. 7. 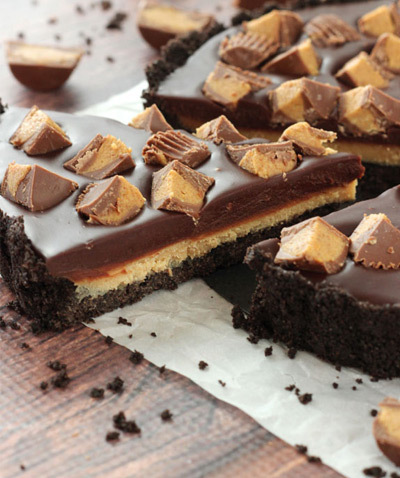 Pour peanut butter ganache into crust and spread into an even layer. Refrigerate for about 15 minutes, or until fairly firm. 8. Put chocolate chips into a microwave safe bowl. 9. Add remaining 1/2 cup of heavy whipping cream to bowl. Heavy cream should mostly cover the chocolate chips. 10. Microwave mixture until cream begins to boil, about 1-2 minutes. 11. Remove from microwave and whisk until smooth. 12. Pour chocolate ganache over peanut butter ganache and spread into an even layer. 13. Top with mini chocolates of your choice..